Home/Trading and Investing Basics/Getting Started/How Do I Trade Online ? How Do I Trade Online ? While most people today understand that investing in the stock market is a good way to generate wealth and beat the inflation. Some are still a little overwhelmed by the process of trading and going through brokers. With the advent of online trading, this process has been simplified a lot. The article is divided into 5 major sections highlighted below and explains the steps involved in trading. Open bank, trading and demat accounts. Access a trading platform called “terminal”. Place an order to trade securities, for example buying shares. The terminal would execute the order and transfer securities. Exit the market by selling the acquired securities. While some of the steps above may seem very complicated, the following sections will break them down for ease of understanding and explain what each of the accounts and terminals mean. Shares of listed companies are traded at a stock market. While these can be accessed online for trading purposes, individual investors cannot directly interact with them for executing trades. Instead they need to open an account with a broker registered with them. The broker would provide the trader/ individual investor with login credentials to buy and sell on the stock market. These transactions may attract brokerage and tax liabilities payable to the broker and the government respectively. These are trading & demat accounts. A trading account is like a bank account which is used to pay for and receive payments from stock trades. This needs to be connected to a banking account (either saving or current) from where the trading funds can be transferred back and forth. This provides one access to trading platform or terminal to place trade orders as desired. 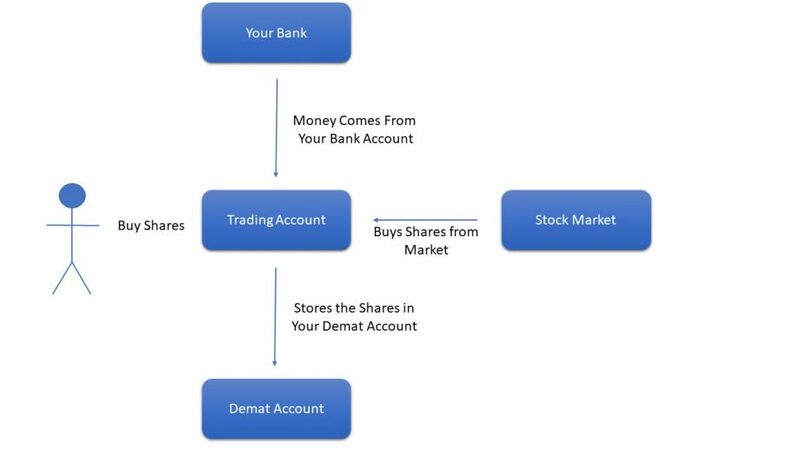 A demat account is like a digital locker where the shares are held in a dematerialized format. Instead of physical share certificates, a digital equivalent will be stored in the demat account. When one places an order to buy a share, the money from the trading account will be used to pay for the same. It is advisable to manually transfer the funds from bank account to the trading account rather than allow for an auto-debit facility based on trading demands. This is important so that the overall investment portfolio is well-balanced between share market investments and investments in other instruments like fixed deposits, saving accounts etc. Once the purchase is executed, the trading account would store the digital share in the connected demat account. Similarly, when a sell order is placed, the trading account would access the demat account to verify the availability of shares for the sale. Once the sale is executed, the funds will be credited to the trading account. It is advisable to periodically transfer any unused funds to a saving account as they would typically earn a higher interest there. Where can one open trading and demat accounts? Income proof – this could any among a copy of income tax return, form 16, salary slip from an employer or 6 months bank statement. Bank account – a canceled cheque leaf or a copy of the first page of bank passbook to verify the bank account details. The application process for opening the account can be started online through the website of the chosen broker. Before the account(s) are opened, a verification process will be carried out – for this the broker may either send their agent to collect the document copies or ask one to courier it to their address. Bank Brokers: Banks like SBI, HDFC, ICICI, Kotak Mahindra, Axis etc. provide a 3-in-1 account. That is saving, trading and demat account rolled into a single service offering – this means one does not have to worry about manually transferring amount between one’s bank and trading account. Since the bank itself is acting as the broker, this becomes a convenience for the trader as no withdrawal request needs to be placed with the broker when funds are needed. Traditional brokers: Traditional or full-service brokers include institutes like Sharekhan, Angel Brokering etc. These provide not just an access to a trading terminal but also tips or recommendation based on their research. Typically, the brokerage charges levied by the full-service brokers are on higher side. These can vary from 5p to 10p per share for intraday (buying & selling same day) and 10p-50p per share for delivery. Discount brokers: One could also open trading and demat account with discount brokers. While these brokers provide an access to trading terminal just like bank and traditional brokers, they do not share any recommendations. This means that a trader/ investor has to do his own research before deciding which companies to invest in. In exchange, these brokers charge much lower brokerage on each order. Unlike the traditional brokers, discount brokers charge a flat fee per order. These could vary from Rs. 5 to Rs. 40 per order. While some like Zerodha may charge no brokerage fee on equity delivery, and charge a flat fee per executed order for intraday and F&O trades. For most traders and investors this results in considerable brokerage savings. How to select a stock broker? Make sure that the broker is registered with all the stock exchanges one wants to trade on, and with relevant regulatory bodies like SEBI. Check the account minimums. Some brokerage firms impose a minimum initial deposit requirement. The reason for it is that traditional brokers cannot make enough money on small accounts. Some may even impose a minimum investment requirement. This may become challenging for people who want to invest in limited instruments – say only in mutual funds for example. That said, there are quite a good number of brokerages that have no lower minimum requirement. Verify that the instruments one is interested in are offered. Also, compare the brokerage fee on investments one plans to make and not the whole gamut of services offered. For example, if an investor is not planning to invest in F&O at all, then the low brokerage on this instrument is completely irrelevant when choosing a broker. Similarly, if one plans to invest 70% of their monies into mutual funds – a lower fee on such investments is far more important than the fee on individual stock trade. Fee for broker-assisted trades. For example, a fee to set up a systematic investment plan i.e. automatically placing the same order on a given date each month. Match one’s trading style and technology needs with what the broker provides. For example, if an investor plans to make a limited number of transactions they should avoid brokers who charge an inactivity fee if a minimum number of trades are not executed in a given month/quarter/year. While a beginner may need help through tutorial videos and in-person seminars which are provided free of cost by many brokers. On the other hand, an experienced trader who will place many orders in a single day would prefer access to analysis tools, advanced trading platform features and discounts of high-volume trades instead. Keep an eye out for promotions. Online brokers, like any other service provider, frequently run promotional schemes to attract new customers. While it would be foolish to choose a broker based on promotions alone, they could turn out to be a sweetener when more than one broker meets all requirements. In conclusion, one needs to open trading and demat accounts alongside a bank account to trade online. While selecting the right broker to start with may seem like a daunting task, following some simple steps at this stage would ensure a smooth trading journey and substantial savings from the reduced broker fees.